Having cancer brings opportunities that maybe wouldn’t normally be available or even on my radar. The henna crown came up a while ago and then was snatched away at the last minute when the studio already had a model. Being me, I think this is because they see a photo of me with my Cushingoid face – ie, swollen and puffy with a charmingly named Buffalo hump at the back of my neck. However, I am delighted to be wrong and receive an email from Soo at the Ash Kumar studios offering me the opportunity to have a henna crown after all. I am very excited. I have looked at images online and they are stunning so the opportunity to have one for myself is very tempting. It’s an early start on an industrial estate in North Acton but we pitch up early and arrive before the staff, so excited are we. It is an amazing experience. The henna artist is a lovely woman called Shafeena (I hope I have spelled that correctly) who has come all the way from Canada, although not just to see me. She is an obstetrician in her daytime job and, miraculously, has not only heard of Inflammatory Breast Cancer but knows stuff about it. She knows it is aggressive and tells me it is the worst breast cancer to have. She knows about the effects of bloody steroids and other drugs. It is impressive, especially as I am not sure doctors in the UK learn about it during their training. So not only is Shafeena slim, beautiful and intelligent but she does a beautiful job with the henna crown. I am seated comfortably on a sofa with my back to the mirrors so I can’t see what she is doing. There is discussion about the design which she has created especially for me and then she begins the process which is not ticklish or cold. I am surprised to hear she is going to use glitter on the crown as all those I have seen online have been plain. I have no idea what it will look like but can tell from Mr Mason’s face that it is going well. He takes lots of photographs on my phone of me in various stages of completion. We have to wait a while before I am unveiled as Mr Kumar himself is going to come to the studio and my lovely henna artist is keen for him to see her work. 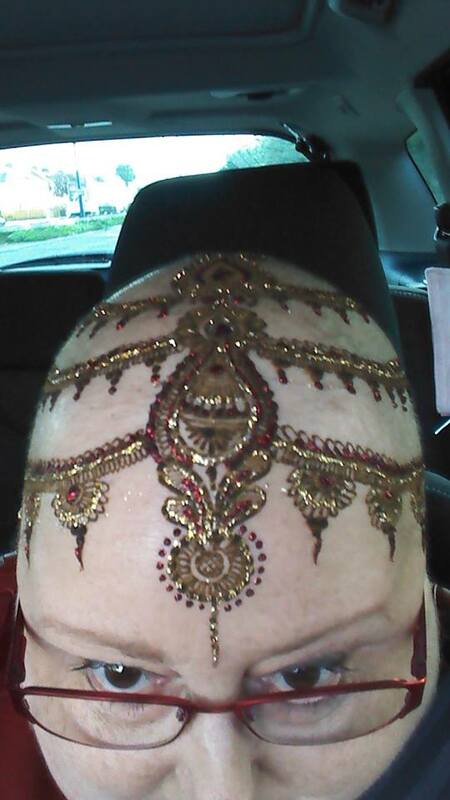 For those who haven’t seen it yet, here is a Henna Crown selfie. It’s a fabulous piece of work and I would definitely have it done for a special occasion. Many thanks to Shafeena for such a beautiful job. I then had a surreal conversation with a Post Office clerk. I had all the paperwork to get my Freedom Pass so took it to the Post Office as required so they could send it off. I had to take the usual proof of address and identity so took my passport and a letter from the Department of Work and Pensions. The lady behind the counter says the letter will not do because it is not about a pension. I tell her I do not have a pension. She bangs on for ages about how it is the Department of Work and Pensions and I tell her that is illogical because you might as well focus on the word Work which, coincidentally, is what the letter is about. She is very cross and asks why I don’t have a tv licence to show her. I explain tv licences are not paper any more. I explain also that the letter, regardless of its content, proves my address. She consults with her colleague who agrees they will not accept the letter. I find it hard to argue with illogical people but I stand my ground and eventually, to teach me a lesson, the assistant decides to phone head office and embarrass me right on the spot by showing me how wrong I am. She explains the letter over the phone, emphasising the word pension which she is obsessed by. Her face gradually twists to simulate one sucking a lemon as her senior head office colleague tells her of course she can accept the letter – it is just to prove address and the content is immaterial. She retaliates by calling me ‘darling’ repeatedly during the rest of our interaction. On Tuesday I go to a meeting in Victoria. Firstly I have to get in the taxi and these days, they always seem to send a people carrier. This I cannot climb into any more. My legs are too weak and Mr Mason watches on while the Polish taxi driver gives me his arm and helps manouvre me into the back of the cab. During the meeting, I write more than usual and find my hand feels paralysed in my small and ring fingers. In fact, I find it hard to hold a pen at all and even eating presents a few problems. My walking is a bit stumbly and I definitely need the stick for propping myself up. When I get home, I try my laptop and for the first time in years, I can’t touch type as my stupid fingers won’t do what I want. On Wednesday I go to see the oncologist and ask her about my hands. The soles of my feet are also fairly numb which lends itself to some good stumbling moments. We know it’s the Paclitaxel but we don’t want to reduce or stop it so I get prescribed some drugs which may or may not help with the numbness. After the appointment I head off to the remainder of my meeting in Victoria and, once I find a cab have to be hauled in by the cab driver. Sigh. I arrive just as the meeting breaks for lunch which is pretty good timing except when eating a plum, I break my front tooth. This requires an email to my cancer nurse specialist as dental work is not really allowed on chemotherapy but with the big trip to Thailand happening next week, it is essential I get the remedial work done asap. Sigh. So easily I slip from one crown to another.